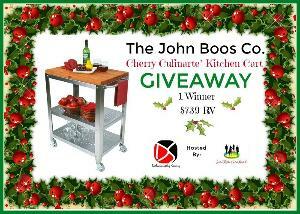 Prize: John Boos Co. Cherry Culinarte’ Kitchen Cart worth $739. What you must do to enter: Enter your email and name on the giveaway form, then do as many tasks that you can for more chances of winning! Statistics: This contest was opened by 46 and entered by 1 ContestChest.com members. 2% of those who opened the contest, entered it.